Ballpark Basics: A classic park that has enough to keep you coming back again and again. 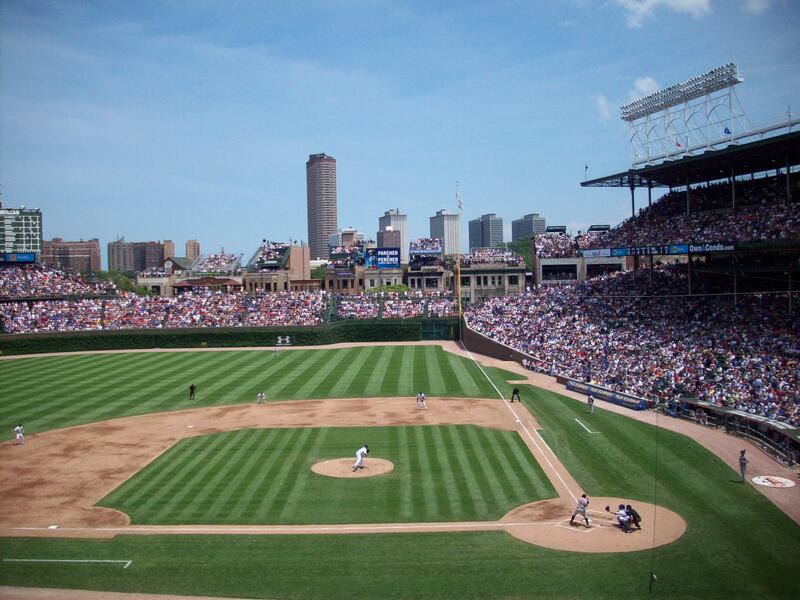 Wrigley Field is (or at least should be) on every baseball fan’s Bucket List. Gillian, growing up in Chicago, crossed it off her list early. Jim however, had to wait until the summer of 2008 before he could finally attend a game at this cathedral of baseball. It was well worth the wait since it was for the first ever inter-league series against his beloved Baltimore Orioles. We highly recommend picking a three game series against your favorite team and go to all three games. You will not get tired of seeing a game at Wrigley. While just going to a game a Wrigley is an experience in its own right, to us, there are three ways to experience a Cubs game to see how truly unique this ballpark is: from the bleachers during a day game, from the good seats, and from the rooftop decks across the street. The only unfortunate thing is that each of these experiences is not cheap. The cheapest way is to get a bleacher seat for a day game. What used to be an inexpensive way to catch a game at Wrigley has turned into a pastime of its own. The Cubs slightly raise the price for bleacher seats during day games (and the good games sell out) but this is by far the cheapest way to go. The next cheapest option is the rooftop decks across the street. Once again, the Cubs have taken an old time tradition and found a way to make a buck off of it. Instead of obstructing the view from across the street the Cubs work in partnership with the buildings and now get a cut of the revenue. With prices starting at $150 a ticket (that includes all you can eat and drink) it is not exactly a cheap endeavor. For some of the early season non-premier games they have lowered the price to $75 per ticket. However, it is still cheaper than the next option: from the good seats. You will need to have a hook-up or use the secondary market to get these seats since they are all taken and you will need to pay a pretty hefty mark-up to acquire them. Once again look to pay up to about $100 a ticket and sometimes more to get these seats (without the all you can eat/drink bonus). The tickets that we scored didn’t even have a price on them so you know that the face value was pretty damn high. With the Cubs currently in a rebuilding process, the ticket prices on the secondary market have come down in the past few years but it still will be an expensive experience. Make sure to add plenty of time before the game to get the full experience of a game day on the North Side. Parking around Wrigley Field is notoriously hard to find and the lots that are close are quite expensive so most fans take the El to the ballpark. 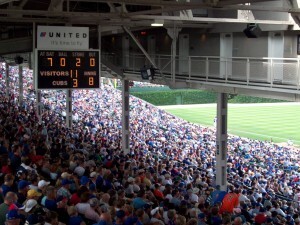 However, this is another aspect that makes going to a game at Wrigley so much fun. The festival atmosphere starts as you enter the train and it continues to fill up with additional fans as you get closer to the Addison stop. Stepping off the train and taking the stairs down to the Wrigleyville neighborhood that surround the ballpark. 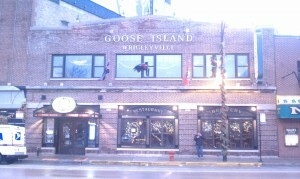 Here you will find a number of bars that are jam packed before and after games including Murphy’s Bleachers right behind the famed manual scoreboard, The Cubby Bear at the intersection of Clark and Addison, Harry Caray’s Tavern and the Wrigleyville version of Goose Island that we review below. The festive atmosphere that starts in the bars continues as you walk through the streets and into the catacombs of Wrigley. Being an old park, there is no wraparound concourse where you can watch the game as you get your food or drinks. This adds to the nostalgic feel as you have to wait until you climb the ramp from the concourse to see the green grass and lastly the ivy covered walls of the outfield. It takes you back to being a kid again waiting to see that first patch of green grass after entering the ballpark. Another part of being an old ballpark is the lack of modern amenities that you will find in every new park. Cubbies fans don’t seem to mind (you may remember the uproar when lights were added so night games could be held) but here are some things to keep in mind. First, there is no video board so you can’t see replays unless you are in the seats underneath the upper deck where there are mounted TVs. This seating area comes with its own pitfalls, in the form of obstructed view seats – great if you’re looking to save a few bucks, not so great if you want to see the whole game. This isn’t to say that the lack of modernization is a bad thing – like Fenway, Wrigley still uses a manual scoreboard that stands above the bleachers has not changed since they added additional lines for the out of town scores, and is always a draw for fans and photo opps. While the beer selection is not as varied as at other major league parks it wouldn’t be a game at Wrigley without an Old Style. They have been serving Old Style at Wrigley for over 60 years. After rumors that Old Style would be replaced as the official beer of Wrigley Field, Pabst Blue Ribbon (the owner of Old Style) agreed to sell the beer in Wrigley through at least the 2013 season. If you’re interested in learning more, Tales, Taverns & Towns has a great history of beer at Wrigley. Definitely worth a read. Another tradition that continues is the W or L flags that fly over the bleachers after each game. Created to let riders on the el know if the Cubs had won or lost that day the team started flying a White “W” flag when the Cubs won and a dark blue “L” flag when they last. 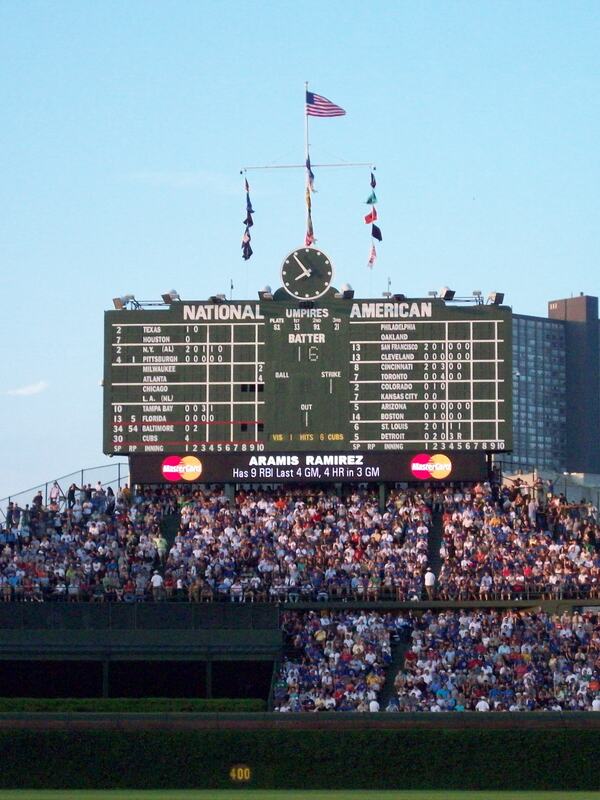 Today many fans bring their own “W” flags in with them in the hopes that they can hold them up after a Cubs win. Gillian and all the other Cubs fans also hope for a Cubs win so they can sing the “Go Cubs Go” song (even if it just a shameless plug for WGN). 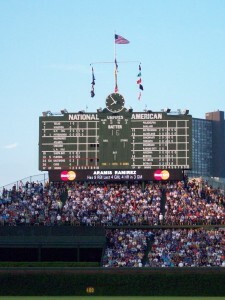 Along with the W or L flag, the Cubs also have flags for the retired numbers (Ron Santo, Ernie Banks, Ryne Sandburg, Billy Williams, Greg Maddux, and Jackie Robinson) as well at the standings for the National League displayed in order. It is easy to see why this place is on everyone’s bucket list. 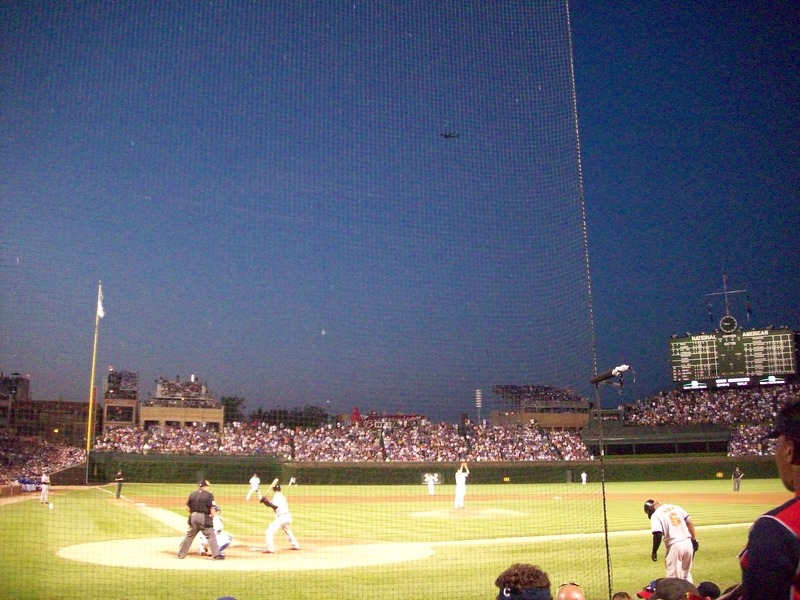 While you may have to deal with obstructed views or slightly cramped conditions, Wrigley provides an experience that you cannot find anywhere else since old ballparks are not a “seen one, seen ‘em all” type thing. 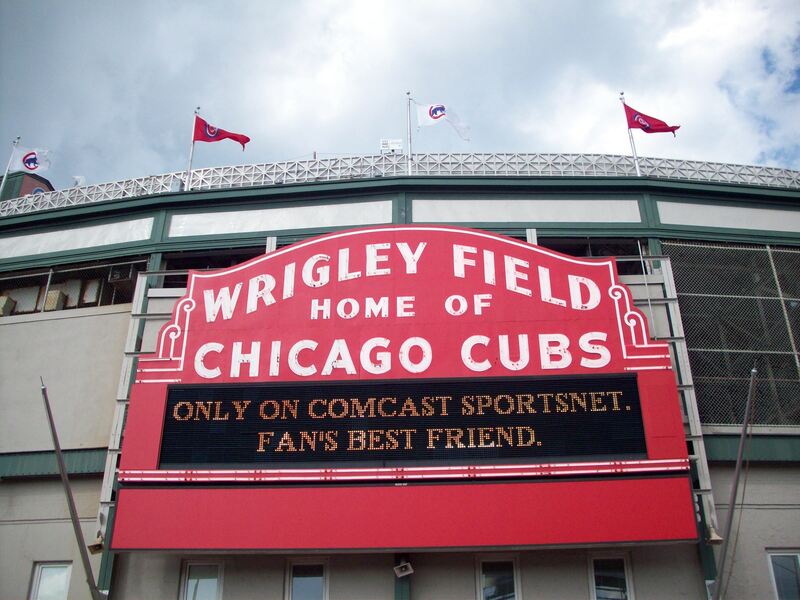 This is one where words just don’t do it justice, We recommend you take the tour, take in a couple games from various vantage points, and have a couple beers in Wrigleyville. Enjoy!! There really is nothing like taking in a game at Wrigley. Beer Basics: A local favorite that’s been called up to the majors, and is probably in a city near you. 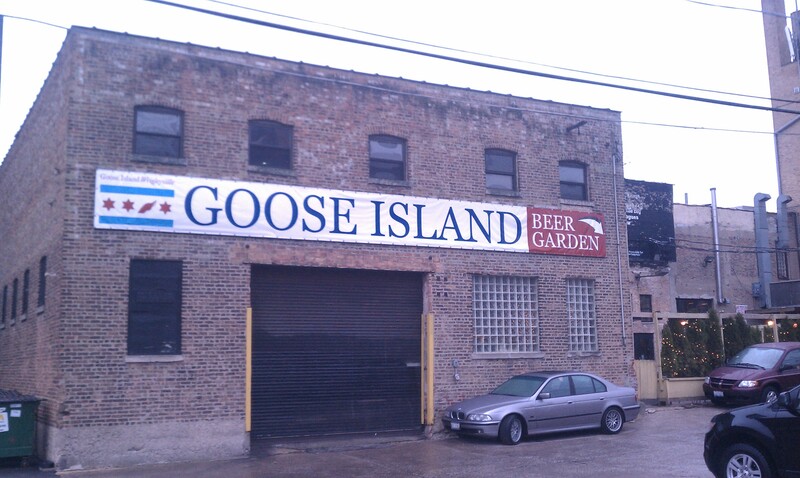 Named for the only island in the Chicago River, you may be familiar with this brewery as they have recently been purchased by Anheuser-Busch and their 312 – signature beer, named for the downtown Chicago area code- is popping up all over the country. Their Christmas Ale is also always a special commodity; somewhat pricey and sold only in packs of 4, but always unique and worth splurging on. There are 2 Goose Island locations in the Chicagoland area, and seeing as we’re not ones to do a job halfway, we visited both the original Clybourne and strategically located Wrigleyville location. It was a typical Chicago winter day – cold and gray with various types of precipitation falling at any given time – so we were more than happy to fortify ourselves with the winter warmers, stouts and porters that were on tap for the late December holidays. We started in Wrigleyville, as we figure most Cubs fans would, seeing as it is right around the corner from the ballpark. The entrance isn’t obvious and we ended up actually walking all the way around the whole block before we got it right. This is a newer location; it has dark wood, lots of seating, a roomy bar area and could be anywhere U.S.A. – not that it isn’t well done, it’s just there isn’t anything to differentiate it. You enter into a host stand/swag shop and can be seated in the dark chairs or go off to a separate party room. Assuming you’re here to hang out after a game, the best place to go is (obviously) the bar area. It’s a great, long copper covered bar, which I’ve come to love mostly because there still seems to be something childishly deviant about letting your glass leave those visible wet rings on the table. There’s lots of space for meeting up with friends, and benches that face the bar for even more seating. After dealing with Chicago weather, denizens of the city make the most of good weather, so there is also a spacious party deck that was easy to picture filled with a crowd of Cubbie fans, even in the freezing rain we were experiencing. The Clybourn neighborhood is a neat, and recently rejuvenated part of the city that’s worth walking around in. 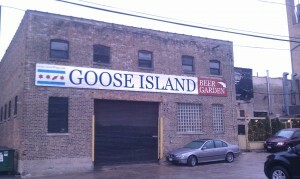 Similarly, the Clybourne Goose Island location is older, but not in a run down way. It has personality, is much less generic than the Wrigleyville location and just has more of a neighborhood bar/Old Chicago style feel. It’s a bit dark when you come in, there are tables around, but weave your way to the center of the main room. There is a rectangular bar set right in the middle with seats on all sides taken by friendly Midwesterners sharing a pint. Along with printout Large chalkboards on the wall let you know what’s on tap (their options are extensive, so it varies by location) and the knowledgeable bartenders are always available to make suggestions, pour you a flight, or drawn napkin directions to the nearest EL station. No matter which spot you choose to visit, they have a good thing going with their flights. For a set price, you can choose any four they have on tap and the bartender will hand-write them on a placemat for you, that comes complete with a “what to look/smell for” and vocab term guide. During the winter holidays as they also have a creative toy drive program going. 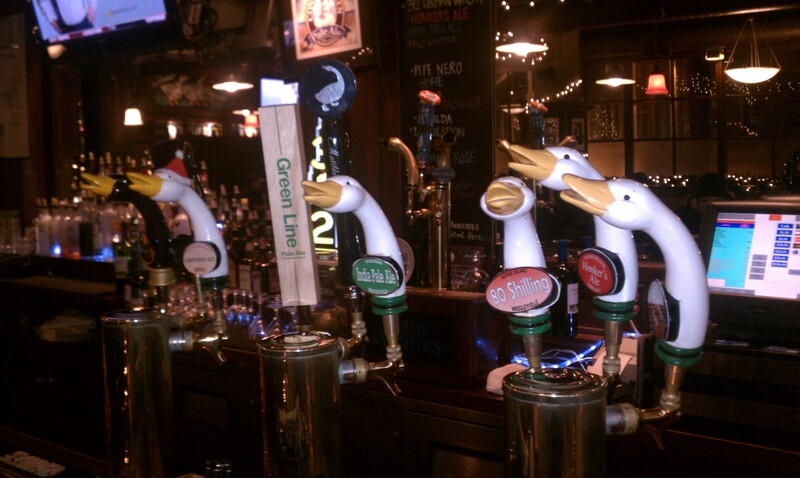 If you bring in a “Toy for Tots”, you’ll get $5 to spend at the pub. They also brew up some crazy concoctions (See the Candy Cane Bourbon below) – and put them on a goal chart. As toys are brought in, they color the chart, and as each goal is reached, they release that beer. 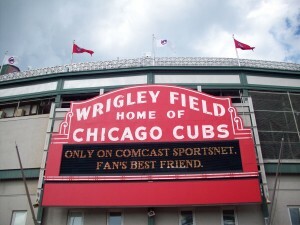 Now we realize that going to visit at Christmas means you won’t get to catch a Cubs game. Never fear. At any given time, they have a lot of seasonals on tap, so go back often because there is always something new to try! Kilglubbin (5.2% ABV) This Irish Red Ale pours out a brown coppery color and smells of malts. It is a light bodied beer, with thin flavor at first. The malts kick in an though the flavor remains light, it adds a lingering rye, almost tinny flavor. Seasons Mild Winter American Mild Ale (5.8% ABV) This beer has a mild aroma that gives just a whiff of coffee and malts. This American Ale has a slightly bready malted mouth taste. The caramel malts blend with the raisin, and combine to give off almost a bacony flavor at the end. Gillian liked this, but Jim was only medium on it. Christmas Ale 2011 (6.2% ABV) – This is a great tradition of beers, whose flavor is unique each year. This is great because it’s always delicious and innovative but can be sad because if you fall in love with one of the recipes (See “Gillian and Jim, Christmas 2010”) you’ll never get quite that same combination again. This beer just always manages to taste like Christmas. One sip and you’ve got a fire in the hearth, cookies in the oven and mistletoe and pine trees in the house. The 2011 brew was dark colored, full bodied with nutmeg, roasted malts and oatmeal. Old Clybourn Porter (6.4% ABV) – This was a robust porter that was dark and reddish (although less so than the seasonal?) It has a strong full bodied flavor; coffee upfront that gives way to roasted malts, which linger in the aftertaste as well. Porter and Proud (7.4 % ABV) – A collaboration beer, with strong anise notes and a tan head. The color is just what you would expect – a deep woody hue. The aroma is roasty and warm, made a little richer by the dark chocolate malts. The taste is barely sweet, robust ad good. Jimmy’s Farmhouse Red (6.2% ABV) – A saison, with traditional higher carbonation you’d expect from this family of brews, a pretty orangey copper hue and white, lasting head. The promised “piney hop aroma” comes through with a surprising hint of citrus as well. The palate starts hoppy and then hints of the sweet citrus pick up blending in the swallow. Candy Cane Bourbon (9% ABV) – A Russian Imperial that smells exactly like the ingredients it is named after – bourbon and mint. We had high hopes for this one, but ended up not liking it. Gillian thought the bourbon flavor was too strong, while Jim (who typically likes anything that has spent time in a bourbon barrel) thought the bourbon was overpowered by the mint, and was disappointed in the downplayed taste. Either way, too much mint or too much bourbon, the flavors seemed to compete instead of combine. Not terrible, but definitely not our favorite of the night. Dark Chocolate Coconut Porter – (7.4% ABV) As soon as we saw this one on the menu we wished we could put all our eggs in one basket instead of pouring a flight. It really lived up to its name, smelled amazing – and somewhat like vanilla but tastes like chocolate. Almost like a spiked mocha. Coconut added sweetness but didn’t override the other flavors or make it too sweet to drink. An excellent porter, and it’s always nice to “drink for a cause” – both this, and the Candy Cane Bourbon listed above were some of the Goose Island Holiday Toy Drive Beers.